Derry259 - We made an attempt at the Mourne Wall Walk last year. We had planned to do it over two days, camping out overnight. We made a few pretty basic mistakes, one being that we failed to check the weather forecast for the weekend, the second being that we packed way too much gear/food and ended up struggling with heavy bags (hiking up Muck in a gale force wind and a thick mist with 10+kg on your back ain't easy). The third mistake we made was that we way underestimated the fitness level needed to complete the walk with said weight. 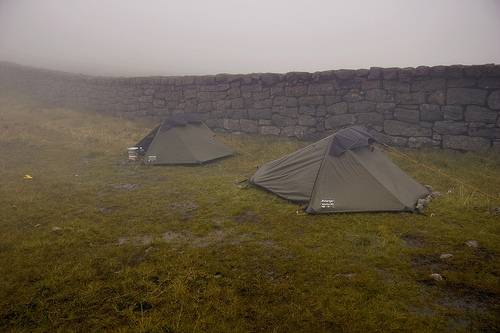 What started out with 4 of us walking from Carrick Little on a beautiful sunny day ended up with two of us spending the night in the col between Carn and Loughshannagh sheltering from a fierce storm in our tents pitched to one side of the wall (2 lads wisely only opted to do one day). Tough going at the time but a real learning experience. We came down the next morning as the conditions were atrocious (since spoke to one person who had been washed out of Annalong the same night and had to walk back to Carrick Little at 4am). Planning to do it this year on one day (minus the heavy packs) as close to the Solstice as possible. May camp the previous night at Meelmore Lodge and walk round clockwise from there. Either that or it'll be an early start on the road and a drive to Carrick Little to walk from there (starting with Binnian). Going to give it a proper shot this year - out doing some running to get fit and planning to walk the remaining couple of parts I haven't been on priort to doing it. Oh, invest in a copy of 'The Mournes Walks' by Paddy Dillon - excellent guide to walking the wall in it..